Expansion Packs are components you install to expand Animoog – some of them are free, some must be bought for a few dollars. They add immense value to Animoog. Most Expansion Packs contain presets and timbres. Other Expansion Packs bring additional features that aren’t bundled with the vanilla Animoog. The following table is an exhaustive list of publicly available expansion packs for Animoog. 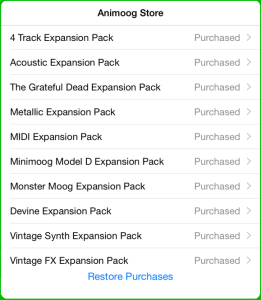 Lots of expansion packs can be purchased and installed directly from within the Animoog app under the ‘STORE’ tab, however, several high-quality presets and timbres are not available from within the app itself — that’s the value of the following table, to help us find those valuable gems no matter where they hide! Please share comments below to help improve it! Let’s me share special thanks to sound designers who created and provide those presets and timbres to Animoog players, without you dear sound designers, Animoog wouldn’t be the Animoog I love so much today. I initially wanted the Expansion Packs table to be directly crowdsourced, meaning that anyone could contribute to it, but I haven’t found a suitable solution to do that yet. For the moment, user comments below will be used. Click on the image below for the full png version of the table. The table includes the list of official In-App-Purchase packs you need installed for the third-party presets to sound as designed without any [missing] timbres. With this information, an Animoog player can know in advance if he has all that’s required timbres before downloading and installing a new third-party pack. I also provide a print-ready static version of the table as a pdf file. 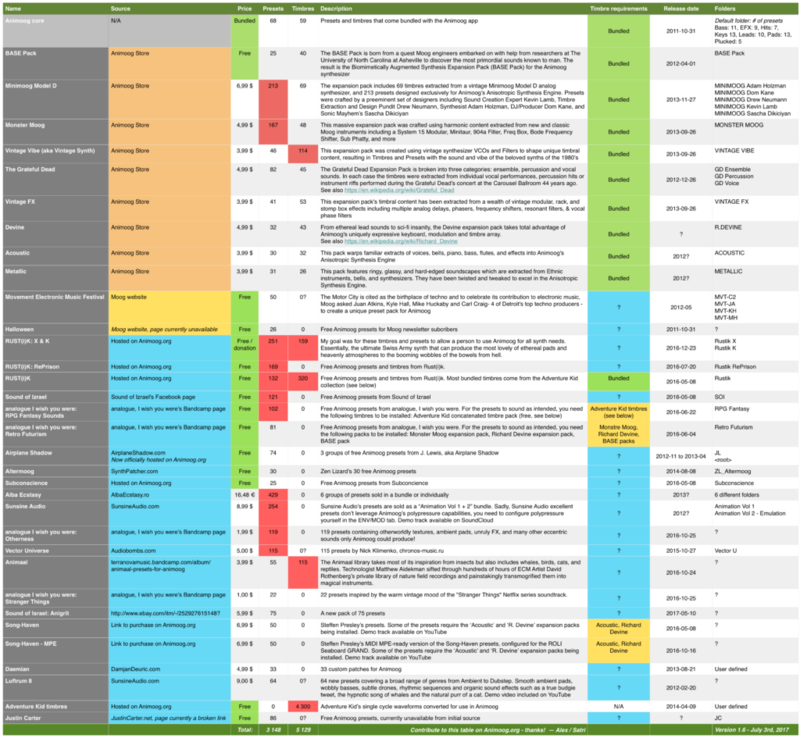 Finally, here’s a trimmed version of the table below — while I removed some columns from the table, it is useful for the download links. Movement Electronic Music Festival Moog website Free 50 0? Vector Universe Audiobombs.com $5,00 115 0? Daemian DamjanDeuric.com $4,99 33 0? Luftrum 8 SunsineAudio.com $9,00 64 0? Justin Carter JustinCarter.net - currently a broken link Free 86 0? To install third-party Expansion Packs not listed in Animoog’s in-app store, there’s essentially two ways; using the iTunes built-in file transfer mechanism (which is pretty cumbersome) or using third-party software, such as iFunbox (free) or iExplorer ($35). The updated official Animoog Manual that came with version 2.2.4 provides the recipe to add presets which are not available from Animoog’s in-app store. It is however much easier if you use iFunBox, which allows you to create and move folders and move presets directly in new folders. You can use this tool to copy third-party Animoog presets on normal (non-jailbroken) iPads. Here’s step-by-step instructions to install third-party Animoog presets and timbres with iFunbox. You have other ideas? Let me know in the comments below! 1.6 – 2017-07-09: Major update! Added free presets and timbres from 6 new expansion packs: Song Haven, Animaal, RUST(i)K’s X & K, Analogue I wish you were’s Otherness and Stranger Things, Sound of Izrael’s Anigrit. Details in the announcement. 1.5 – 2016-07-20: Major update! Added free presets and timbres from sound designer ‘analogue I wish you were’ Retro Futurism and RPG Fantasy Sounds, and new presets from Rust(i)k: RePrison. Added a column in the table for the “Timbre requirements”. Details in the announcement. There’s now also a link to the step-by-step guide to install presets. No mention of the b.a.s.e pack? No longer for sale in Animoog store, but anyone who bought the pack can still download/restore it. Intended as april 1st joke, yet the timbres are very useful. Umm, maybe for some people. I personally was a little irritated at having paid for an April Fools Joke. Just not into eructations, flatulence, and gastric gurgles, I guess. I would like a link to download the base pack. Hi Richard – Moog doesn’t offer it anymore… I guess you can write to their support and request it. Maybe they’ll add it eventually as an in-app purchase? Any links to the free presets that are missing online now? It seems the airplane-shadow website is gone. Is there a way to get these presets or the base pack? Hi Jagged Doctrine. Right, Airplane Shadow’s website is down now. Zut. Here’s his YouTube channel: https://www.youtube.com/channel/UCVLtAlKNKoW13WaNyOzOBUA … but the actual presets were hosted on his website… I’ll try to contact him to see if he allows me to host them on animoog.org … if he agrees, I’ll post an entry. This question has probably been done to death, but as I cannot find it, I’ll ask: Will AniMoog presets work with the Theremini, which uses the AniMoog engine? Is it worth even trying? Thanks for the response. Unfortunate. Of course, I am looking to acquire as many presets for my Theremini as I can (wouldn’t anybody?). I have been to the link you suggested and have those presets and maybe another two or three I have found out there–there is not much. If you know of a larger collection, I would LOVE to hear about it. Meanwhile, so much for the AniMoog engine being the same. As a developer myself, I can’t help but think that if they really were the same, the presets would be more or less universal–or at least the Theremini would ignore those parameters not pertinent to its use and load what is common. Unless I am missing something, that seems like it would make too much common sense to actually work, but I may try with a set or two and see what happens & report back if I get a positive outcome. Meanwhile, as I try to revamp my MIDI workstation from where I left it in the mid 90’s (in other words starting over), I have found that there is an AniMoog VST out there for MAC. If one existed for Windows, it seems like one could use the presets out there with the Theremini through the VST, using the Theremini as a MIDI controller. Using the Theremini that way is one of the reasons I actually purchased the thing. Seems to me that as a controller, one could create music (I am thinking melody lines and pads–mot to mention broadly) much the way the Jackson Pollack painted (semi-conscious). I have yet to test that theory, but am working towards it. If I am right, it makes the Theremini far more expressive than is immediately obvious to the musical hobbyist like myself. Thank you again & of course welcome any additional thoughts you or others may have on any of this. Thank you so much for all of this work! Loaded a bunch of timbres and presets using PhoneView and started experimenting a bit. Playing with timbres really opens up fascinating things, especially if you control the app via an external controller, like Air Craft’s Sabre app. Pretty sure some of Rust(i)k’s RePrison presets require timbres from “The Grateful Dead Expansion Pack”. Haven’t bought that one but some presets show a bunch of “GD” prefixed timbres as missing. One of these is “GDWeirVox”, and it sounds like there was a Weir character in the Grateful Dead band, so it sounds very likely to be the issue. In the case of “Seq FizzCritters”, all the timbres are missing (and they all start with “GD”) so the result is silence. Replacing them with sine waves might not work so well. Could buy that pack, of course. But there are so many neat sounds with which to play that pack purchases will have to wait. Will start by experimenting with some timbres and donate money to those made them available. Adventure Kid sure deserves more than thanks! As you do, really wish Moog were to allow for a better method to manage content. The iTunes-based method made sense in earlier versions of iOS but, at this point, we kind of expect something like iCloud. At any rate, thanks a lot for all your help! It’s quite possible that RePrison requires Grateful Dead timbres. I’ll add this to the notes in the table. Thanks! Indeed, I too wish Moog will revamp the way we manage presets and timbres in Animoog. As a non Facebook user of Animoog I am seemingly barred from getting the Suzanne Cianni expansion. Is there any way of getting these presets other than the Facebook “Yo the Animoog!” Route? Doh! You are correct. I must have been having one of those moments. Hello! I wanted send you a link to update my broken link – that is now fixed. https://www.justincarter.net/product/animoog-timbres-01/ Still Free! Please any chance of finding again the Movement.zip preset pack not available from the Moog anymore ? Hi pino, you’re right, it seems the link on Moog’s page is broken… Have you tried contacting their support staff? Would be nice if they could indeed bring it back available! Can anyone provide a link for the deleted Grateful Dead preset patch? Hi Dmitry, are you in Instagram?